You’re probably here because you’ve read this excellent post by Ed Blankenship. If you also want to enable Kerberos Authentication support to this configuration there are a few more steps involved. This post will only deal with configuring the Kerberos Authentication as it relates to SQL Server, I will cover the TFS and SharePoint configuration in another post. If you are accessing the friendly names on the same computer they refer to you may receive the following error: HTTP Error 401. 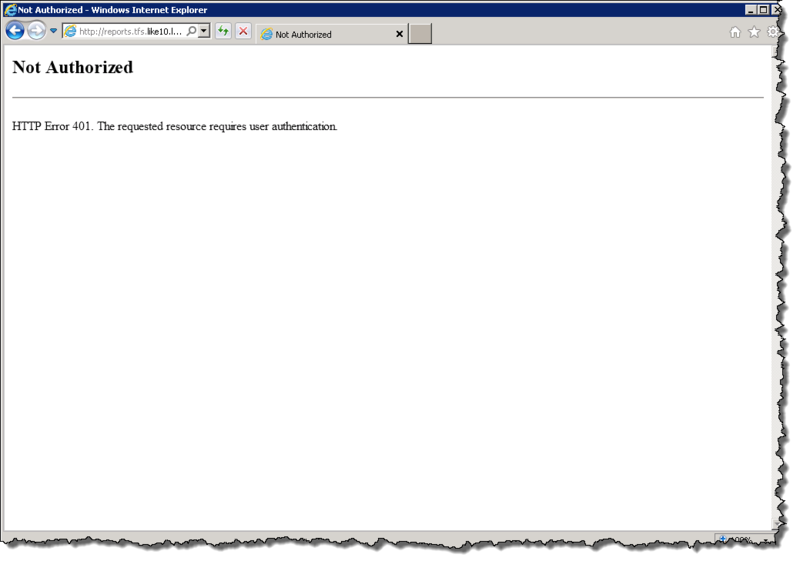 The requested resources requires user authentication. An example of this is where I am on the TFS Application Tier and Launch IE and attempt to browse the SQL Server Reporting Services website which is hosted on the local machine. If this occurs then you probably have not disabled the Loopback Check for this friendly name, please refer to this KB 896861 on the methods to resolve this. To continue I will assume you have friendly names configured for all of your various servers and/or applications. The first two SPNs above are for the SQL Server Database Engine, the next two SPNs are for SQL Server Analysis Services, the next two are for the SQL Server Browser Service and the last SPN is for the HTTP endpoint for SQL Server Reporting Services. NOTE: SPN formats have changed starting with SQL Server 2008. If you are running SQL Server on a different port or using a named instance please reference the link and format your SPN accordingly. If you are running Analysis Services as a named instance you must also format your SPN to include that information, please refer to the following KB 917409. If you are using a named instance for Analysis Services or of SQL Server you must also have an SPN for the SQL Server Browser Service, please refer to the following KB 950599. The Account is sensitive and cannot be delegated setting is not enabled for user accounts that will be delegated. 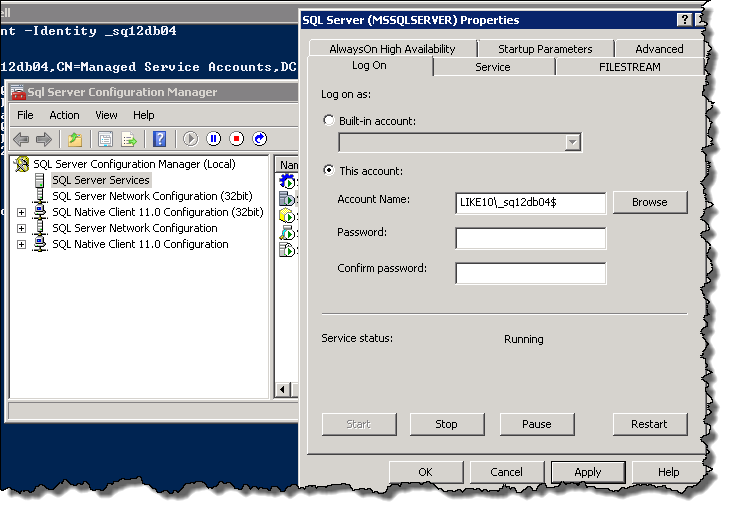 The Trust this user for delegation setting is enabled for the domain account of the middle tier that is connecting to SQL Server (Database Service or Analysis Service). For example, if IIS is the middle tier and a domain account is used for the application pool, that application pool domain account must have the Trust this user for delegation setting enabled. The Trust this user for delegation setting is enabled for the accounts of all services and COM+ components that are involved in the process. The Trust this computer for delegation setting is enabled for all the computers that are involved in the process. Find the server that is hosting your TFS Application Tier/Reporting Services and Right Click, select Properties, select the Delegation tab and select the “Trust this computer for delegation to any service (Kerberos only)” radio button and click Apply. Find the domain account that is running the SQL Server Reporting Services Service and Right Click, select Properties, select the Delegation tab and select the “Trust this user for delegation to any service (Kerberos only)” radio button and click Apply. If you don’t want to use the command-line (setspn command) to create your SPNs you can use ADSI Edit to update the servicePrincipalName Attribute of the various domain accounts referenced above. If a domain account is configured for the Reporting Services service account and an SPN is not configured this configuration might prevent users from accessing the service. The first two should be located on the database server and the last one should be located on the TFS Application Tier. 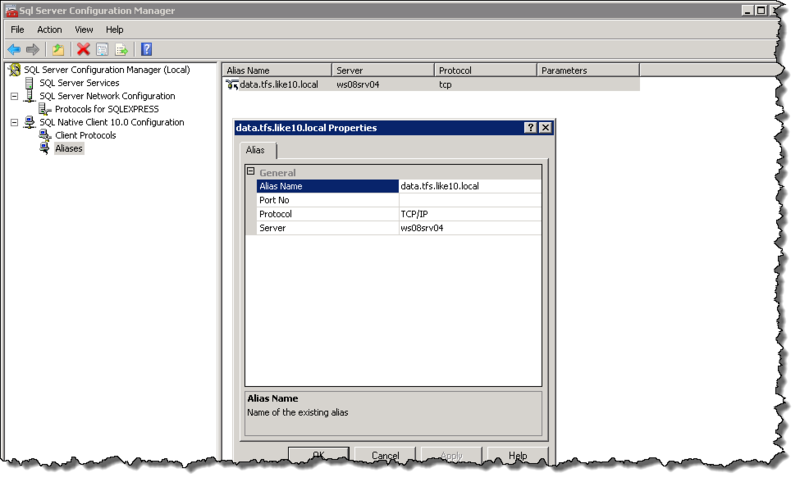 On the TFS Application Tier you must create a SQL Alias, to do this I recommend you execute SQL Server Configuration Manager to configure your Alias. 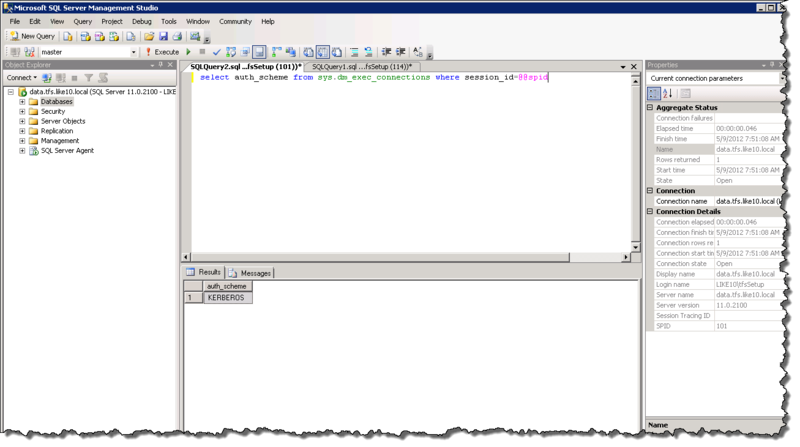 This step is required so that when a SQL connection is made to your friendly name Kerberos Authentication will be used. This will show you the authentication scheme being used on the current connection (your SSMS connection), this will verify your Alias is configured correctly. From a client computer (not directly on the TFS Application Tier) navigate to the SSRS friendly URL you have configured. Note you may have add the URL to the “Local intranet” zone. If you have any questions on the post please feel free to leave a comment. A Managed Service Account (MSA) is a domain account created and managed by the Domain Controller. An MSA has the rights to register an SPN (Service Principal Name) with Active Directory and you are not required to manage the password either! NOTE: Make sure you keep it under 15 characters or you will have issues on the HOST trying to install it, specifically: Install-ADServiceAccount : Cannot install service account. Error Message: ‘Unknown error (0xc0000017)’. Windows 2008 R2 RTM/SP1 require the following hotfix to be applied. NOTE: The account installing the MSA needs to be a local administrator and permissions to modify the MSA in Active Directory. If the installer account is a member of Domain Administrators it will work, if not you will need to delegate modify permissions to the service account’s AD object. Can you let me know what is a SPN and why we need it here? You don’t need an SPN unless you want to configure Kerberos authentication for your TFS services. You can read more about Kerberos vs. NTLM here.